Art, I am curious about something. I have been a long time reader and occasional poster. I get your slap stick and Sarcastic humor. However, don't you get tired of posting the same thing? I am not trying to diss Bro, I am just wondering?? c'mon man - did you ever get tired of Abbott and Costello's 'Who's on First' routine??? Filthy!!! Don't we just love Green??? did you ever get tired of hearing Led Zeppelin play Stairway to Heaven? did you ever get tired of watching the Festivus episode of Seinfeld? did you ever get tired of seeing beautiful women on the beach in bikinis? did you want the Yanks to stop winning championships after number 20? like I saw Glenn Fry say in a documentary once... "I'm sick of playing 'Take It Easy' but the f-n fans want to hear it so I do it!" 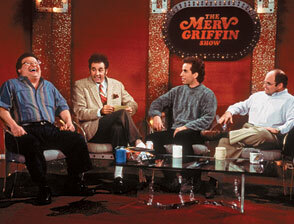 I'm partial to the Merv Griffin episode, actually! Come to think of it.....I'm a rare New Yorker who has not seen a single Seinfeld or Friends episode.